In April of 2017 we returned to Turin, for an updated feature on this lovely Northern Italian city visit our Vegan Eats in Turin 2017. Gelato and Sorbet are everywhere in Italy and Turin is no exception. 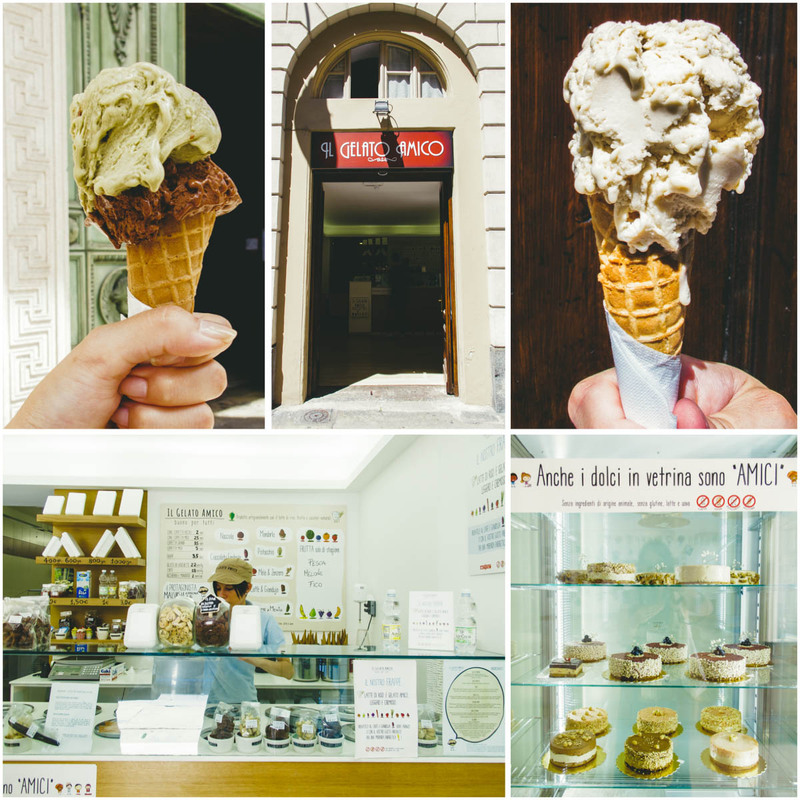 The Torinese are known for having a sweet tooth, so it should come as no surprise that we have tried some delightfully exquisite gelatos, sorbets and granitas during our summer in Turin. You must keep in mind that not all sorbets are vegan and most gelatos aren’t vegan because they contain dairy and/or egg. Fortunately though, we were able to find 3 vegan-friendly gelaterias in Turin – including the uniquely decadent and creamy rice based, gluten-free, vegan gelato from Il Gelato Amico. 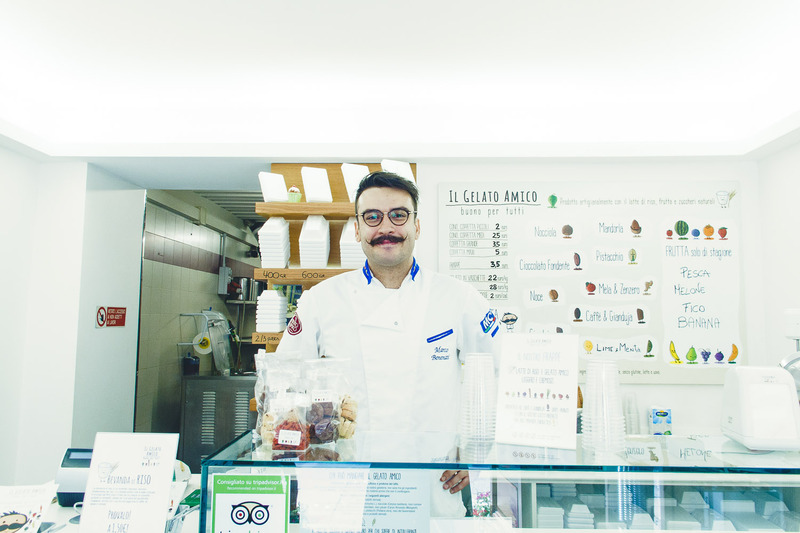 In Il Gelato Amico, Turin has one of the most unique and inclusive gelaterias in all of Italy. 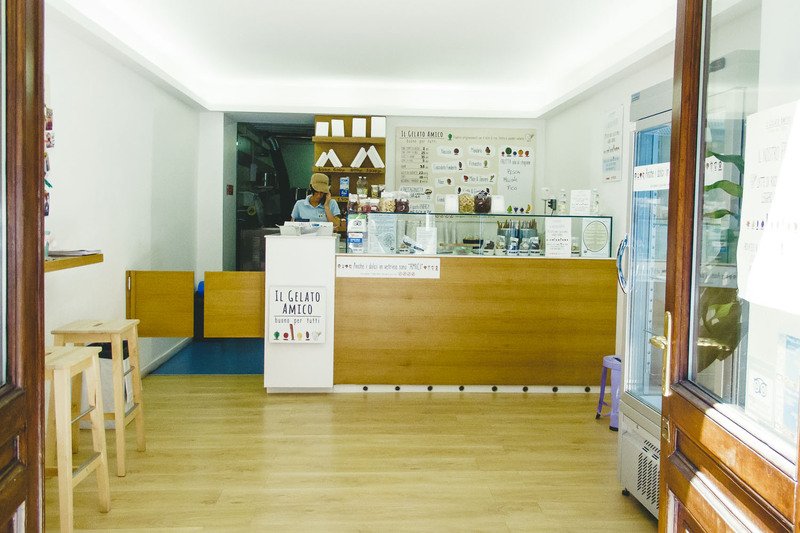 Along with being vegan, the rice based gelato from Il Gelato Amico is also gluten-free, in fact the entire shop is gluten-free. Turin is located in Piedmont, a region that produces more than half the rice in Italy and nearly a third of the rice in Europe and has strong historical and economic ties to rice production, so using rice as the base for a gluten-free vegan gelato isn’t just inclusive, it’s sensible and local. 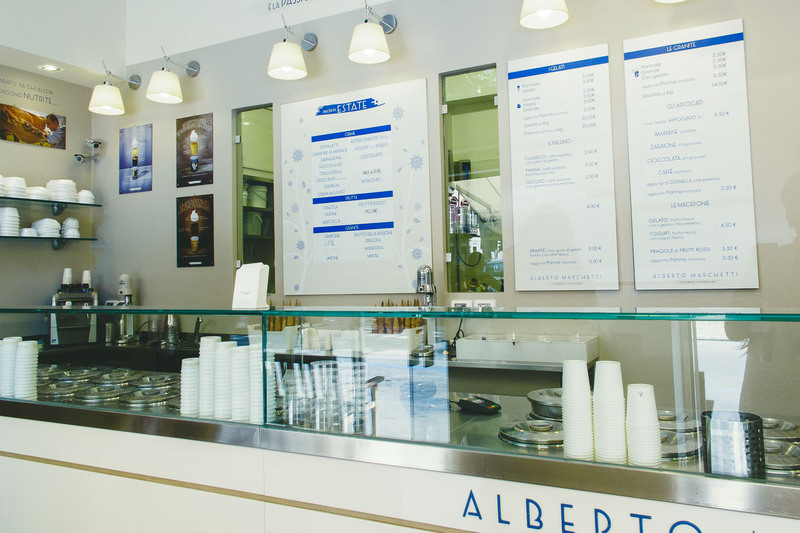 Established in 2013, the relatively young and small (no seating, as is typical of gelaterias) Il Gelato Amico, is located a short walk from the main train station – Porta Nuova, the city’s largest landmark – Mole Antonelliana, and the busy shopping streets of via Roma and via Lagrange. Situated on a quiet street, the storefront is easy to miss if you don’t know what you’re looking for. A large board with cute characters depicting the flavors hangs behind the counter, listing the primary and seasonal flavors along with prices and serving options. All of their cones are gluten-free. Vegan cakes are displayed in the front and change regularly, they usually appear to be chocolate based. Biscotti are also available and the ingredients are listed in store. In total we tried 5 flavors: Nocciola (Hazelnut), Pistacchio (Pistachio), Gianduja (Chocolate-Hazelnut), Caffé & Gianduja (Coffee & Chocolate-Hazelnut) and Fico (Fig). The hazelnut and pistachio flavors had a rich, creamy natural nuttiness. Gianduja is a traditional chocolate-hazelnut paste from Piedmont, and essentially the original Nutella (also a local product of Piedmont). Just like the locals, we love anything with gianduja! Caffé & Gianduja is perfect for anyone who enjoys coffee because in this mixture the coffee overwhelms the chocolate-hazelnut flavor of the gianduja. Fig was noticeably lighter than the other flavors and a nice change from the nut based flavors we tried but in the end we still preferred the richer flavors of the nut and gianduja options. My favorite combination is pistachio and gianduja! Lovely nutty flavors with decadent chocolate! Miam! We had the pleasure meeting the owner of Il Gelato Amico, Mark Benenati today and tried “The Special One” Gelato (raw, gluten-free and vegan) consisting of banana, date, cacao and mesquite. It was creamy and tastes like raw banana with a slight mesquite flavor. In addition to the unique gelato, we tried chocolate & pesca (peach) gelato. It was super tasty! 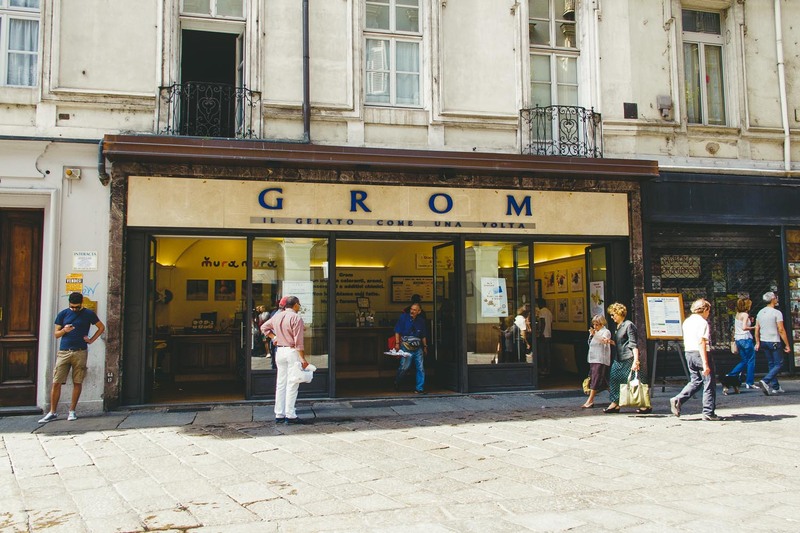 Founded in Turin in 2002, GROM is an international Gelateria chain that focuses on using the best natural ingredients while never using any added flavorings, colors, preservatives or chemical additives. 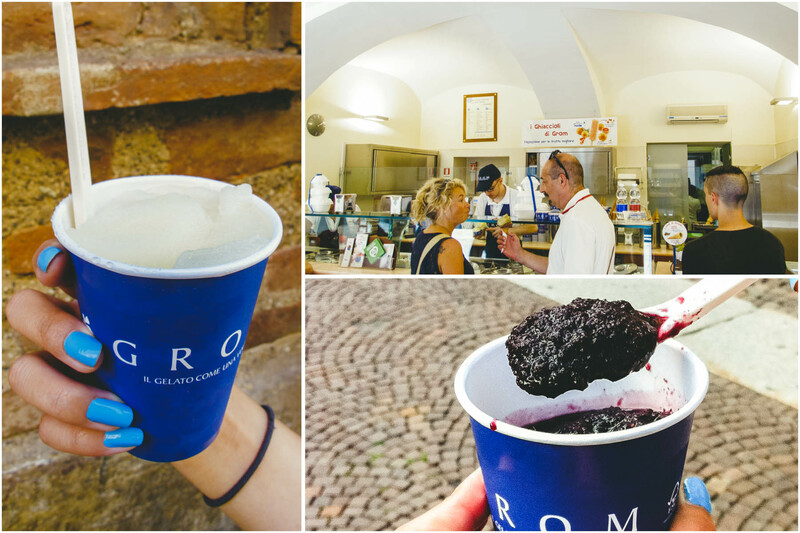 GROM has locations across Italy along with Gelaterias in Paris, California, New York and Japan. In Turin, you’ll likely find a GROM near any major landmark or square in the city center. 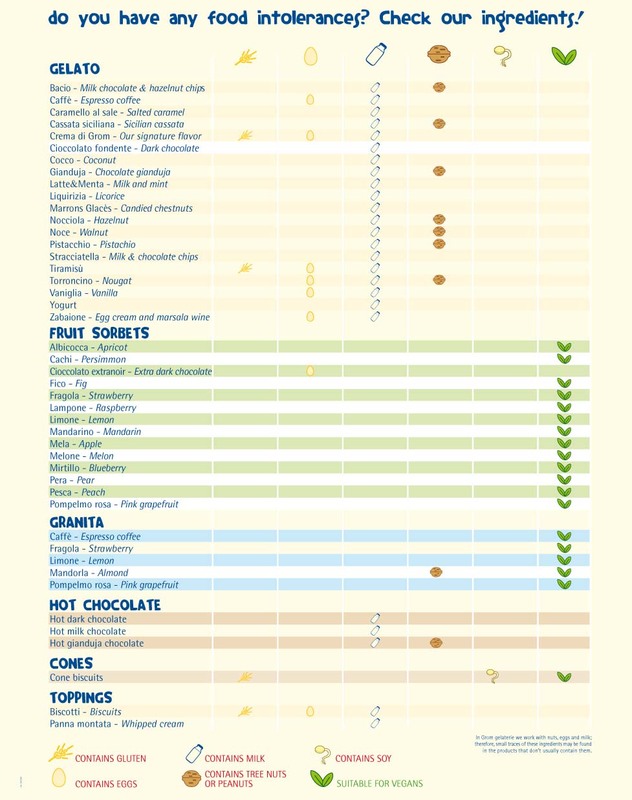 We love the fact that the GROM website includes a guide to all of their vegan options along with a checklist for a few common allergens (soy, gluten, nut, egg, dairy). Currently, all of their granitas are vegan, their biscuit cone is vegan and all but one sorbet are vegan (the only non-vegan sorbet is ‘cioccolato extranoir’ – extra dark chocolate, which contains egg). GROM does not currently offer a vegan gelato. 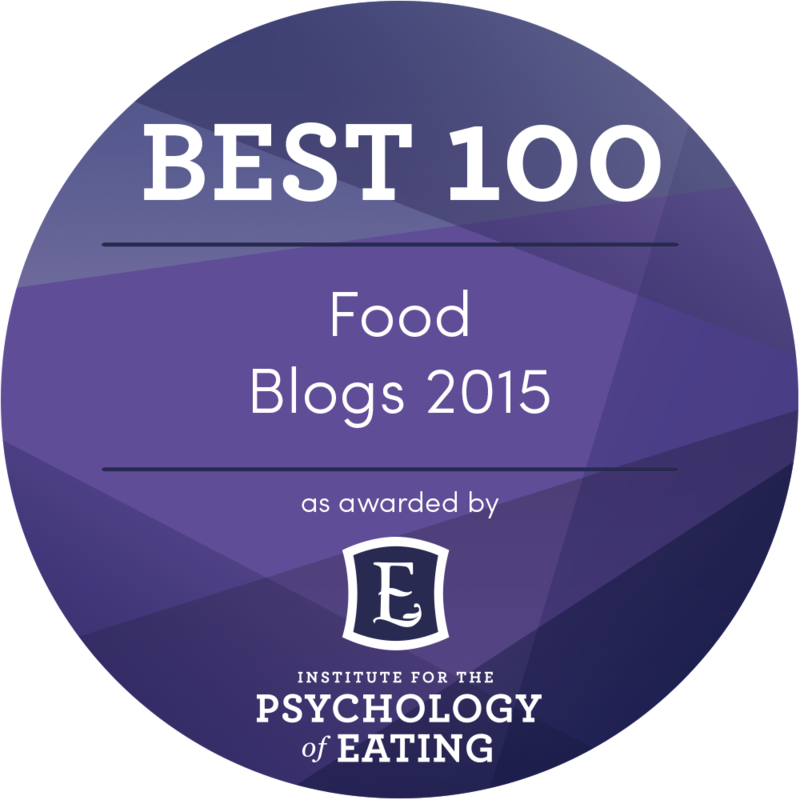 For the most up-to-date information, be sure to check out their site. We tried two Sicilian granitas (Mulberry and Organic Lemon) and we highly recommend the Organic Sicilian Lemon granita. It was sweet, tart and deliciously refreshing. It had beautifully natural Sicilian lemon flavors and it was exactly what we needed on this particularly hot summer day. A medium was €3 and a large was €4, don’t expect Starbucks sized drinks here though – the large was quite small but adequate for one person since you don’t need much when it’s packed full of natural flavors. 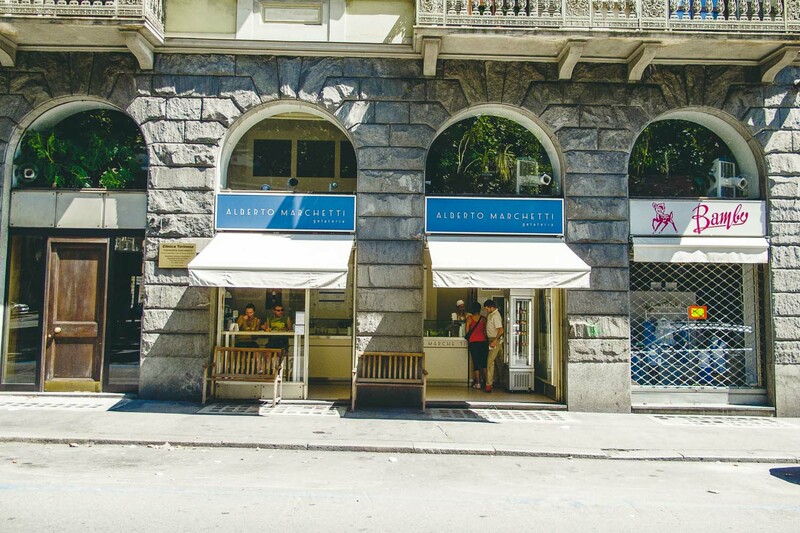 We heard of Alberto Marchetti Gelateria prior to arriving in Turin and the most appealing aspect this gelateria was their focus on using and promoting the limited number of natural ingredients used in their sorbet. 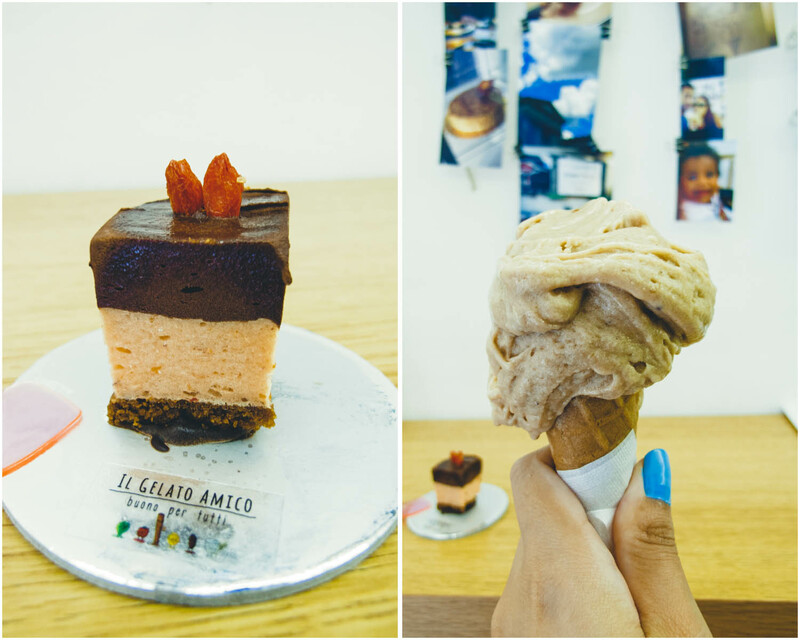 The first of their now six locations across Italy (three in Turin alone) is located just around the corner from Il Gelato Amico. The vegan options here are limited – you have your choice of fruit granitas and fruit sorbets, which amount to about half a dozen options. We tried the fresh yet indulgent Melon Sorbet. Since there are so many melons around the markets and the aroma and flavor of fresh melon is just too good to pass up, this was an obvious choice for us. The sorbet was soft and almost overly sweet but done so in a way that was consistent with the decadently sweet melons we had tried from the market. It was essentially like eating a frozen pulped melon, refreshing but with a sweetness that required you take your time. This was a great option on a sweltering summer day. One large cup was €3 and more than enough sorbet for the two of us to share.